Gordan is the clean template with less complexity. If you like simple templates with the elegant look, then it is best suited for you. It has beautiful social buttons with the search bar. It has two column layouts; auto read more and beautiful post teasers. 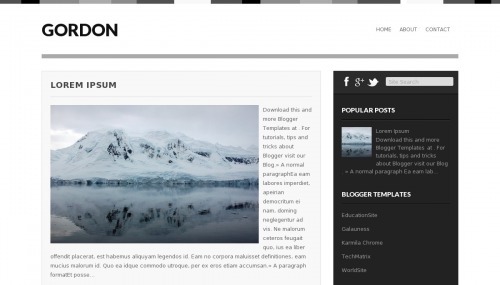 Gordon is a free blogger template adapted from WordPress with 2 columns, right sidebar, minimalist, social bookmarking icons, posts thumbnails, and neutral colors. Excellent template for blogs about to write a diary or photography.